Share your C-Lium Fibre story and win! More and more people are losing more and living more with C-Lium Fibre! Aside from Biggest Loser Pinoy Edition finalists, Art Mendoza and Angela Lupangco, and me and the other online ambassadors, new faces were added to our growing C-Lium Fibre family! First, there's Richard Yap who's more popularly known as Papa Chen or Sir Chief. He's been taking C-Lium Fibre as part of his fitness regimen and he admits that C-Lium helped him manage his weight and lower his cholesterol and blood sugar levels. No wonder he's still so "papable" even at age 45! Meanwhile, joining Art and Angela and co-Biggest Loser Pinoy Edition finalists Hazel Chua and Raffy Tan. The duo once weighed 206 lbs and 287 lbs respectively. Now sporting healthier and leaner bodies, both are on their way to reaching the goals that they were restricted to do when they were still obese. Lastly, Lose More, Live More promo winners Michael Lopez, Pehpot Pineda, Ryan Ong, and Lady Bell Dimapilis are also sharing how C-Lium Fibre has helped them reach their weight loss goals. They are now enjoying the benefits that C-Lium Fibre has given them and are looking and feeling more younger and healthier each day. You, too, can start your journey to wellness by adding C-Lium Fibre to your everyday regimen. Taken daily with proper diet and exercise, you can look forward to a healthier you with C-Lium Fibre! 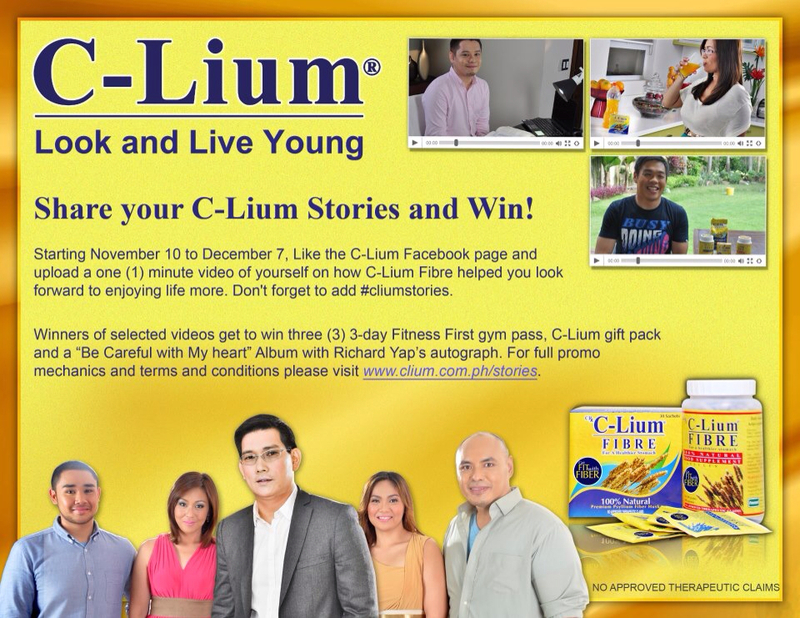 Then, share your C-Lium story to the world to win Fitness First passes, a C-Lium Fibre gift pack, and a Please Be Careful with My Heart CD authographed by Sir Chief, Richard Yap himself. Visit http://www.clium.com.ph/stories/ to know more about the mechanics of the promo.